We are very proud to announce the launch of Metadium’s Mainnet v1.0 today. You may visit the block explorer at https://explorer.metadium.com to check if the token swap was successfully completed for your holdings. The past year’s bear market was tough, but our team was determined to overcome it. While the methods in which blockchain companies develop and present their technologies may vary, the factor of greatest importance is mass-adoption. The decision to launch the mainnet several months ahead of schedule was made with the intention to bring actual use-case services onto the mainnet for mass-adoption of blockchain technologies as soon as possible. The launch of the Metadium Partnership Program(MPP) directly supports this initiative. Tight collaboration with other industry leaders keeps us at the forefront of the latest technology trends and provides us with the basis to roll out practical use cases that will change the world. As we have already shared with the community, more MPP will be released periodically in order to vitalize Metadium’s ecosystem as well as the more details on collaborations with already announced partners. 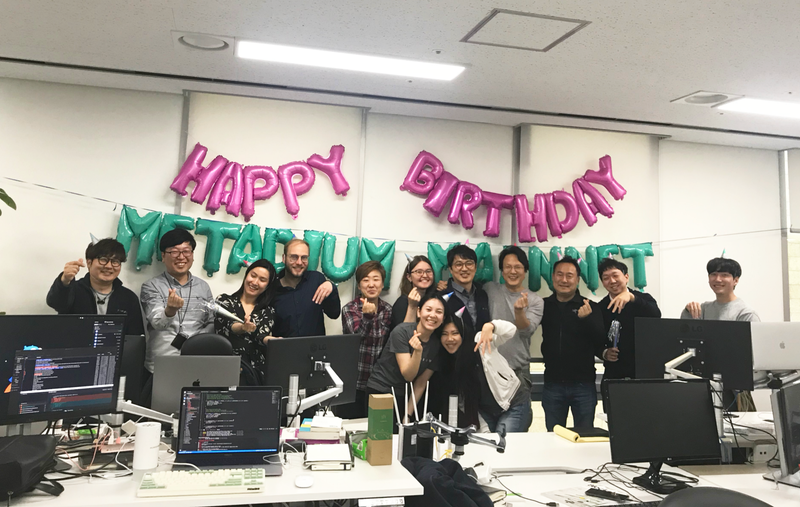 Part of our team at the launch of Metadium mainnet. The rest is hard at work attending meetings. The rise of blockchain technology brought the opportunity to use decentralized technology to return identity autonomy back to the individual. The commonplace of data breaches and hacks today shows to what extent our personal information, and by extension us as individuals, are exposed. Self-Sovereign Identity (SSI) is a paradigm shift in the way identity is framed and thought about. Simple and necessary principles allow for this new identity model which synergizes mundane (analog) and virtual (digital) identities and provides further depth of your overall identity. In addition, SSI opens up new ways to implement a truly P2P-based economic system, where people are directly connected and able to interact with one another without identification or trust issues. This cuts out unnecessary intermediaries and minimizes costs while enhancing efficiency of the system. Metadium, born in early 2018, is the next-generation identity system powered by blockchain technology. We will build an identity blockchain ecosystem through a system called Meta ID. The role of a Meta ID is to provide a service that supports user-authentication and personal information verification. As an identity-blockchain, Metadium is a framework in which all CRUD operations (create, read, update, delete) of Meta IDs are controlled by ID owners themselves, not a centralized entity. Additionally, actions carried out using the Meta IDs are stored in the form of transactions on the blockchain. However, the Metadium blockchain does not store any personal information. Metadium believes that security and privacy are fundamental rights of individuals. Thus comes our vision to create a free world through self-sovereign identity. With the creation of our genesis block came the creation of the Metadium mainnet. It was crucial for us to create block 0 and make bringing the Metadium blockchain to life special. A genesis block is the first block of a blockchain and is hardcoded into a majority of applications which use the chain for reference and for infrastructure. To achieve our vision, we need to create a reliable and sustainable blockchain that could support a global scale identity infrastructure. Said another way, Metadium is a high-performance general purpose public blockchain. A Self-Sovereign Identity using Meta ID, paired with a high-performance blockchain, Metadium, presents a world of opportunities for blockchain application developers. Entrepreneurs can create valuable services that lead to entirely new consumer behaviors. We encourage you to contribute to the development of Metadium self-sovereign ecosystem with us. Metadium client, gmet, is the command line interface for running a full Metadium node implemented in Go being forked from Ethereum, geth, source code. You can download gmet source code or compiled binary code from Metadium repository. By installing and running gmet, you can take part in the Metadium network and transfer coins and tokens between addresses and contracts. You can also create EVM based smart contracts and interact with them. Moreover, you can explore block history and much more. Metadium consensus mechanism: Stake based Proof of Authority (PoA) with Raft leader selection algorithm up and running at authority nodes. Deployment on real network environment, running on 9 authority nodes deployed worldwide. Qualified organization can apply for Metadium authority to be a direct contributor of ecosystem. At stage 2 we are planning to scale up the size of authority pool and introduce the concept of validators in order to consolidate the governance decentralization. A blockchain explorer (Mainnet and Testnet) to display addresses, transactions, and blocks. Metadium block explorer supports smart contract verification and read functions. Users can also use write functions to interact with deployed smart contract using Metamask. Metadium block explorer supports various Open API services only to registered users for free. Please try by yourself. Without installing Metadium client, gmet, users can reach out to Metadium blockchain via public Open API service (Mainnet and Testnet) around JSON RPC over both HTTPS and WebSockets. Metadium has adopted the PoA consensus algorithm based on the Raft leader selection algorithm. It can provide a stable service to users participating in the network and a performance of several thousand TPS or more. Block producers for producing blocks in Metadium have already been agreed upon. They will take block commissions in exchange of processing transactions generated by the users and providing services to them. Metadium is considering the implementation of a Validator Group to alleviate the somewhat centralized configuration of a SPoA model. The Validator Group will monitor the actions of the Block Producer, and report any abnormal behavior to manage and check the reputation of the Block Producer. In Metadium, an authority can utilize voting for adding a new authority members to participate, and for removing a particular member displaying abnormal behavior. Governance is open to selected partners now, which will be announced soon, and will be open to general public at Mainnet stage 2 around 2019 Q3. Governance candidates must install Metadium client, gmet, in their own machine. After staking META to staking contract via governance dApp, they can apply to join the governance group. If candidate is accepted by other governance members through contract voting, they can start generating blocks and receiving collected transaction fees in a transparent way. A Developer’s Guide to Metadium Mainnet will be released on March 25, 2019. Developers will be able to participate by downloading and compiling the Metadium code; connecting to the boot node; and syncing. With your Meta coin, you will be able to create smart contracts, run transactions on our platform, and more! Thank you all for your continued interest in our project and in helping us bring our passions to life! Assess the full potential of the Metadium blockchain by exploring all its features and possibilities. We would be thrilled to have you contribute to its, and all our, further development. We are always open to feedback, so please get in touch with any technical questions or suggestions via tech@metadium.com. Follow us on Medium, Facebook and Twitter, and join our Telegram Group to receive the latest updates. Download our Keepin application on the App Store and Google Play.